You’re about to read a hard-hitting piece of journalism that might change your perspective on Hanukkah forever. Okay it probably won’t, but like, maybe? I’m just going to go ahead and say it. Hanukkah is the most lit holiday of all the holidays. A bold statement, we know. But hear us out. Sure, Christmas has Christmas trees, Christmas decorations and Christmas sweaters that all involve festivity and things that light up. 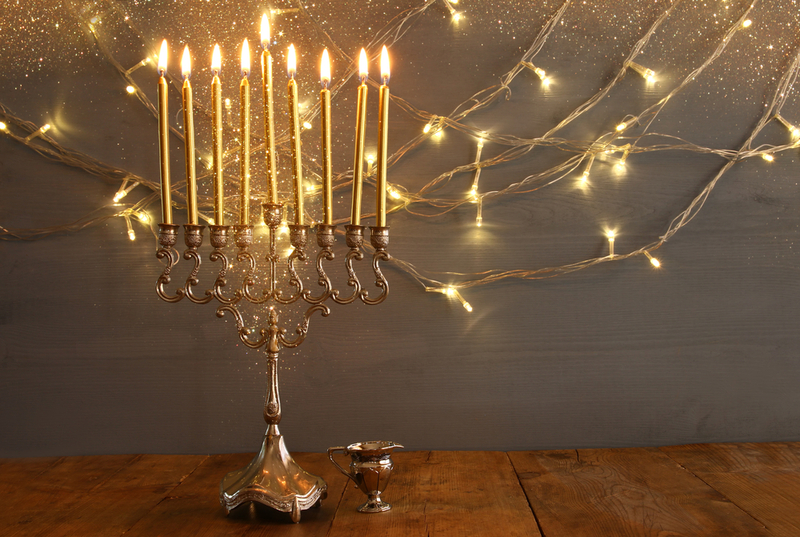 But Hanukkah is known as the “Festival of Lights,” so being lit is in the title. Aside from the literal lights, there are so many other reasons why Hanukkah is pretty great. Christmas is also great, but since Christmas and the beginning of Hanukkah fall on the same day this year, we need to separate ourselves somehow. So here are some of the reasons why Hanukkah is the best. 1Hanukkah lasts for eight days. That’s eight days of celebratory candles, singing, Jewish food and gifts. 2We get socks and toothbrushes as gifts. As an adult, socks and toothbrushes are fantastic gifts. Kids can obviously be super greedy when it comes to gifts. They have no idea how much money their parents spend making sure they are able to brush their teeth, wash their hair, and not have terrible B.O. all year long. We’d be pretty happy if someone bought us of our essential toiletries as adults. 3Spinning things is really fun. It’s very possible that some non-Jews are really good at spinning dreidels, but it’s pretty tough to beat Jews at the game their people invented. We have Judaism to thank for our athletic spinning ability. This holiday is awesome for brushing up on some Hebrew. Maybe not a lot of Hebrew depending on how you celebrate — but enough. And knowing SOME Hebrew is way more Hebrew than not knowing any at all. And that’s a pretty cool thing. The third best part of any holiday is the food (after the gifts and spending time with loved ones, of course). And Hanukkah is no different. Jews get to eat latkes, matzah ball soup, brisket and donuts (AKA sufganiyot). That’s right, DONUTS for dinner. 6We get to light candles, and not just recreationally. There are a few negatives to lighting the menorah for eight days straight — wax drips everywhere and you’re fearful that at any moment, all the candles will fall over. Plus, you can’t really leave the house until all the candles burn out. But the menorah is one of the greatest parts of Hanukkah. It’s our Christmas tree. It symbolizes Jewishness, and lets neighbors know we have a little holiday light situation of our own. It’s also just really pretty to look at. 7We get to eat Chinese food and go to the movie theater on Christmas. Instead of wearing Christmas PJs and eating meat pies (that’s how Christmas morning is celebrated, right? ), we will be dining at a local Chinese restaurant and seeing a movie at a local movie theater. And we’ll be in bed by 9:30 p.m., just as God planned. 8We get our gifts before everyone else. The date of every Jewish holiday is based on the Hebrew calendar, and the date of Hanukkah changes every year. But this year, we get to open our first gifts on Christmas Eve. Granted, we won’t finish opening all the gifts for a whole week after that, but we don’t need to talk about that part. 9We never have to take down a Christmas tree. We also never get to put one up, but the taking down part seems tedious and boring. If you’re Jewish you get to bypass all of it (until you get married to a non-Jew, then sorry, can’t help you). 10No one ever really has to know how to spell Hanukkah. There are at least 15 ways to spell Hanukkah, and none of them are wrong. People just can’t seem to get it together, and that’s fine. If there’s no right way to spell Hanukkah, no one can ever misspell it. So it’s a win/win. There are around six songs dedicated to Hanukkah, and four of those are Adam Sandler’s “Hanukkah Songs.” We’ll take what we can get.